This is compulsively readable, don’t balk at the length. Print it out if that makes it easier for you; you could enjoy the irony of doing so while you’re at it. The health of print media has been discussed at some length on this blog before, look over here. For the attention-span-deficit, a quick summary: news = important, paper = not so. During the wrenching transition to print, experiments were only revealed in retrospect to be turning points. Aldus Manutius, the Venetian printer and publisher, invented the smaller octavo volume along with italic type. What seemed like a minor change — take a book and shrink it — was in retrospect a key innovation in the democratization of the printed word, as books became cheaper, more portable, and therefore more desirable, expanding the market for all publishers, which heightened the value of literacy still further. Read the whole thing here. I recommend you do. Unfortunately, not many Americans have cultural curiosity keen enough to care about how the rest of the world views our country. 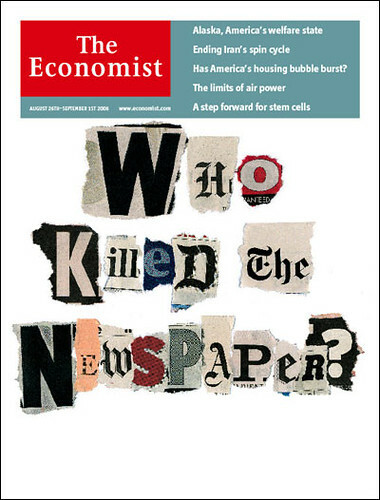 I love The Economist. Every time I travel, I buy one before I board the plane. And to a person, every American tourist sitting next to me asks me, what is that magazine you’re reading? I used to live in Seattle, where the P-I just went digital. Now in Kansas City the paper has had staffing cuts upon staffing cuts upon staffing cuts. The safest of all employees are those who are involved in the paper’s online version. Having acquired a couple of birds, one being a large parrot, I am not only nervous about having grown up used to holding the paper while drinking coffee in the morning (the only civilized way to become fully awake in my opinion, which takes me a good 45 minutes) but find that now I am growing fearful about what I will use instead of the newspaper I am used to re-using, in the garden as compost, in the fire as kindling, or lining the bird’s cages. Thanks to this post, I’m going to go read that article the old-fashioned way: go out and buy a copy. The Economist is always worth it.